The past few days of relatively un-stimulating riding would not be in vain, as they brought me to the start of one of the most amazing pieces of riding I have ever, and suspect will ever, have in my life. 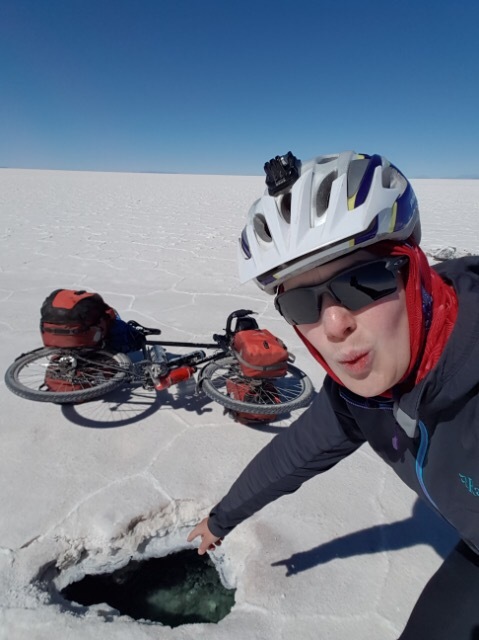 You can watch my short video of the experience filmed on the bike on YouTube here: https://youtu.be/aHe9xkpOa18 (or search for ‘Cycling the Salar de Uyuni’). 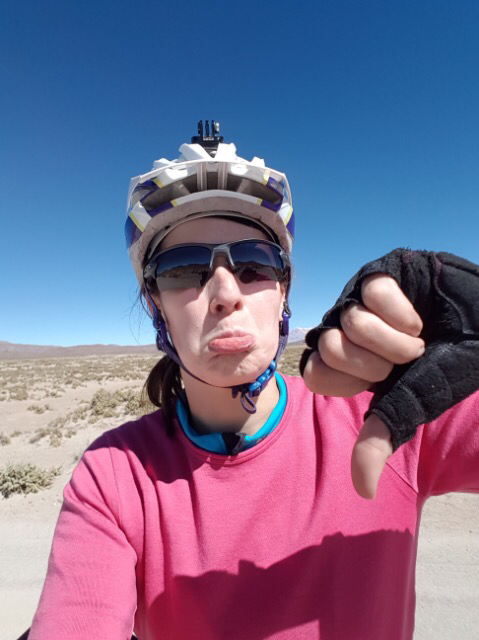 Cycling the Bolivian Salars (salt flats) requires some preparation and forethought. With few landmarks, you need to be clear where you’re heading. With very few people around, you also need to be sure to carry enough food and water, not just for the planned journey but also to see you through if you get into any kind of trouble. 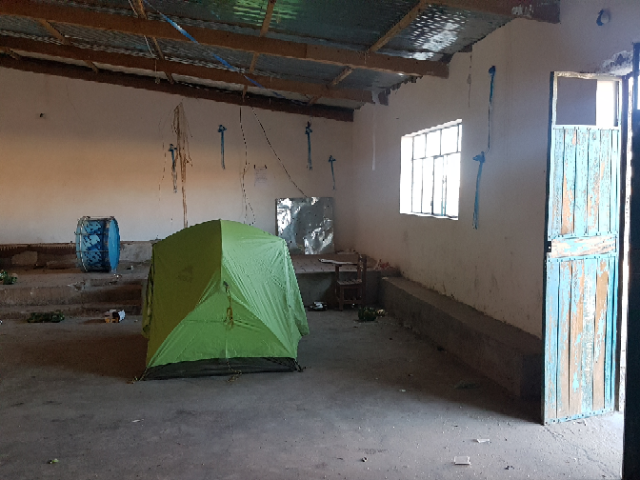 The day before I set off from Sabaya, I was pretty nervous checking through and packing up my things. With food and water for at least 3 days, that was at least an extra 10kg of weight added to the bike, a hefty load that I’d never ridden with before. 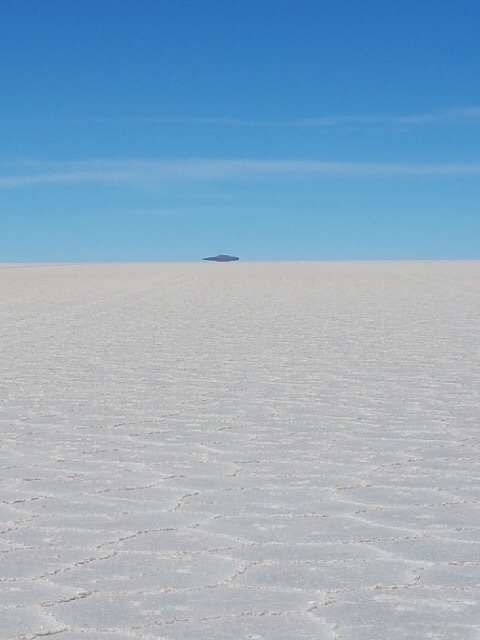 I also had no clue how I would react psychologically to being in such a wide open space alone – would I relish the experience or would it send me slightly bonkers? Thankfully the group from the Casa de Ciclistas back in La Paz, and Honza in particular, had given me some excellent advice about the route, telling me exactly where there were opportunities to re-fuel (as many of the villages marked on maps are abandoned) and warning me as to where the going would get tough. So I finished packing up my bags, slightly jittery, and snuggled into my sleeping bag ready for an early start the following morning. I set off along the track out of Sabaya and towards the Salar de Coipasa. This first day would be a relatively short stint on the salar and would give me a flavour of things to come. It was a bit of a baptism of fire! 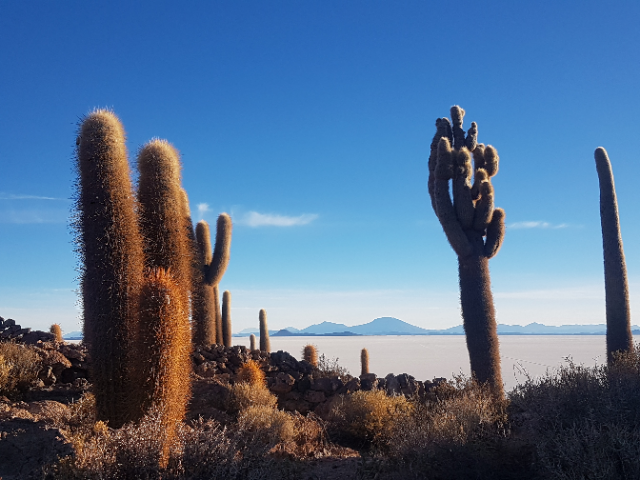 Before reaching the salt flat proper, the ‘road’ began as 4×4 tracks weaving across the altiplano. I started following in those tracks, where the surface was generally harder and easier to navigate. Oftentimes, the tracks would split leaving me wondering which one to follow. Occasionally they would head to villages which now appeared to be abandoned. I set my sights on a small peak on the opposite side of the salar and picked the tracks that seemed to head closest in that direction. Eventually the tracks ran out, leaving me to battle through some pretty rough surface. With a fair bit of sand and grave it wasn’t long before I’d come off a couple of times, and had to pick my moments as to when to push and when to persevere. Riding in a low gear to keep the momentum going, progress was pretty slow! Eventually I joined the salar proper. With trepidation I set out to cross to the Isla de Coipasa in the middle. Wow! The surface became increasingly white and sparkling, as the sight of ‘land’ gradually slipped away behind me. After 10 minutes my nervousness eased and I relaxed into the ride, hearing nothing but wind whistling past my ears. 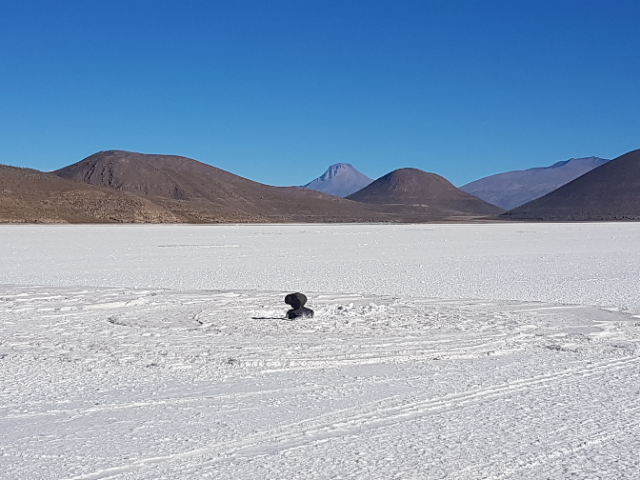 The Salar de Coipasa is by far the more ‘remote’ of the two salars, and I didn’t see a soul for the two days I was riding across it. It gives an amazing sense of other-worldliness, and of course a reminder of how small and insignificant we are. Whilst the salar is completely flat, you can see the curvature of the earth as you scan the horitizon. The salar also has a glowing halo effect from the sun’s rays bouncing off the salt crystals. 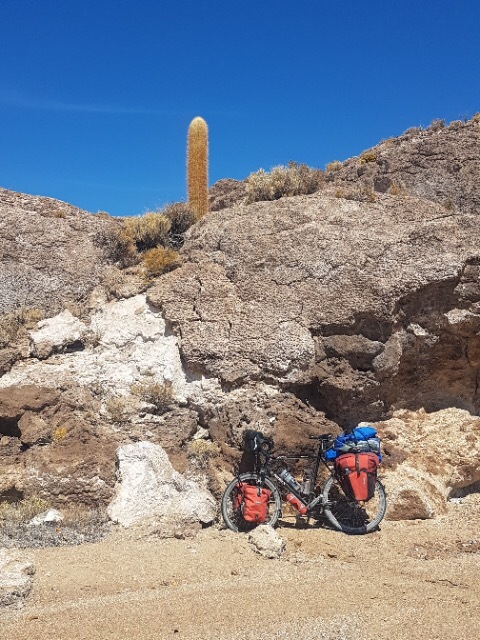 Along with this magic, the Salar de Coipasa wasn’t without it’s own challenges – the surface was very wet in places which meant the bike could sometimes drop through the crust and also got covered in a lot of salt build-up. 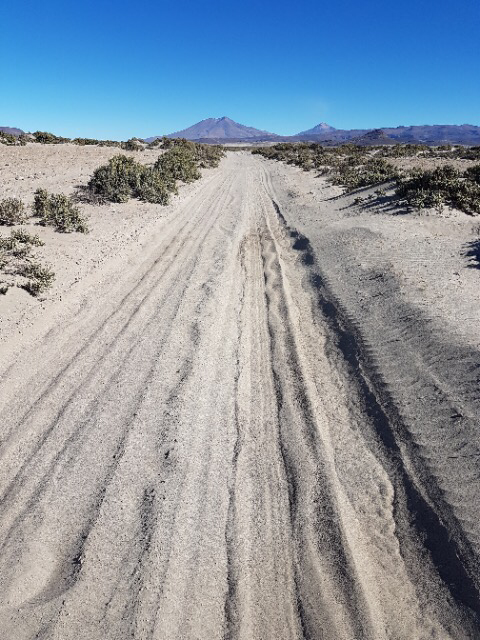 Just like the entry to the salar, the exit is also sandy and muddy and not alway possible to ride on. 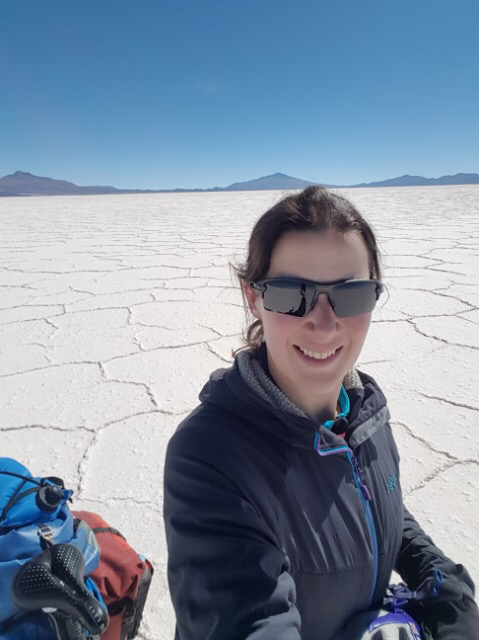 The feeling of being out on the salt flat in the middle of all that nothingness is still definitely a once-in-a-lifetime experience, but it doesn’t come without some hard work to get there! At the end of the first day, I hauled a very salted-up bike up onto the Isla de Coipasa eager to crash for the night. Unfortunately the only room in the only ‘hospedaje’ in town was already in use. Thankfully a local lady came to my rescue and let me stay in her spare room. Her chickens didn’t seem to appreciate my presence, trying to peck at my legs, but I was very grateful for somewhere warm (ish) to sleep for the night. 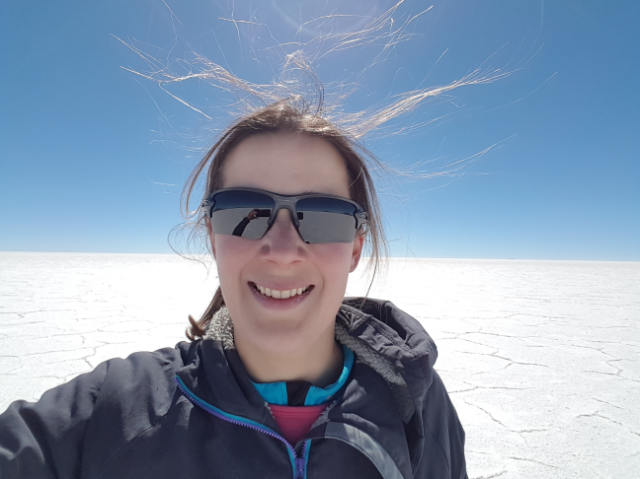 The next morning I headed back out to the salar for a 40km crossing over to the other side. 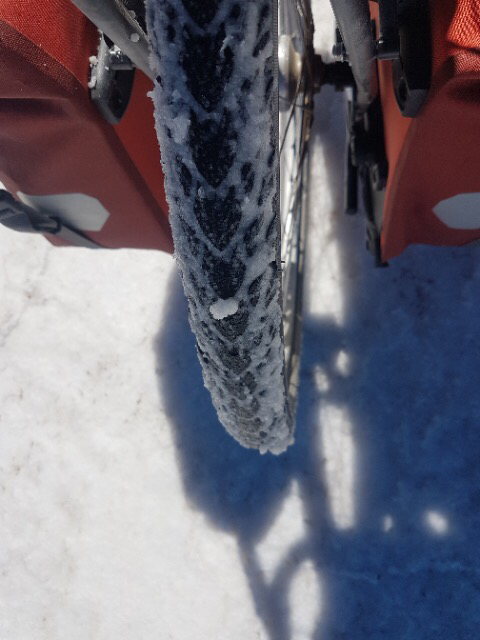 Now more mentally prepared, I had an amazing few hours riding across the white, sparkling, pristine salt surface, with a feeling of exhilaration at the sense of freedom. As I’d already learnt from the day before, getting off the salar may not be easy. This second day was no exception. After 40km of nice riding on the salt flat, I was aiming for the next town called Llica. I had another 40km to go, crossing over a small pass to get there. Then, after about 25km onto land, the sand hit. And it didn’t go away. Oh it was tough! Pushing at between 2.5-5km/hr, it’s a good job no small children were in earshot of my expletives is all I can say! 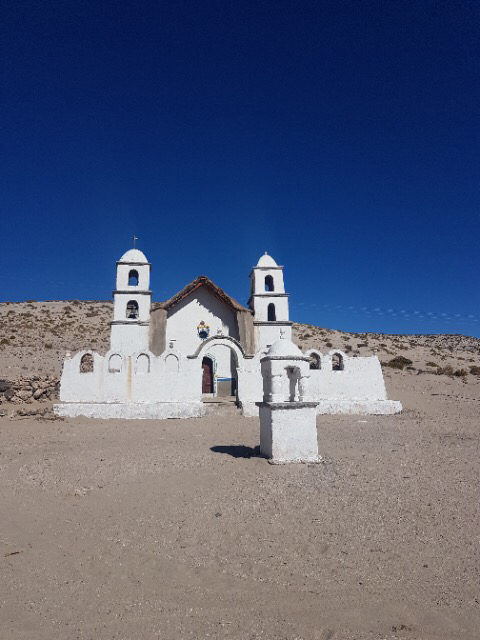 I compromised on my plans and decided to stop 10km earlier at the pueblo of Challacollo – the contingency supplies I was carrying made it an easy decision. Oh was I happy as I wheeled the bike into the village, and even happier as I spotted a couple of people in this semi-inhabited village. They told me I could sleep in their abandoned town hall for the night. It was pretty dirty and full of old beer cans, but by that stage, I really didn’t care. I pitched the tent inside for an extra layer of insulation and cooked up my trusty pasta, tomato and tuna carbo-load dish, then bunked down for the night. 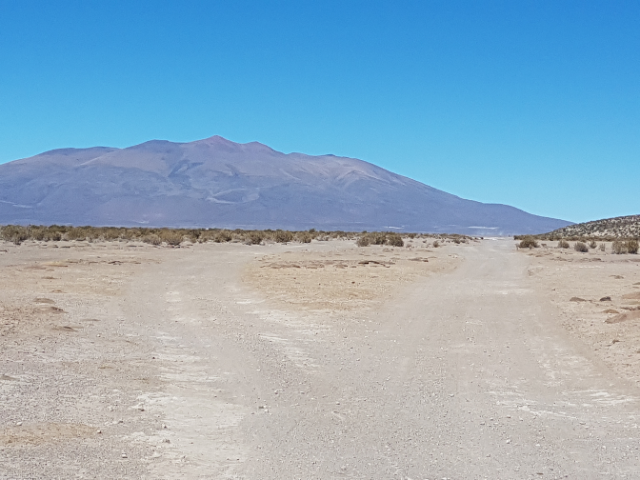 One of many split tracks leading to the salar – which route to take? 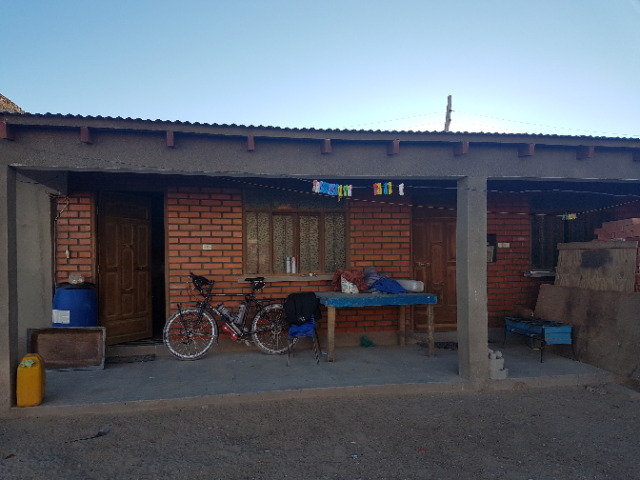 Arriving at Challacollo – sighting this semi-inhabited village felt like discovering The Lost City of Gold! The next morning I took my bike for another walk (through sand again), to reach the town of Lica. I arrived before lunch, and the extra half day gave me a good opportunity to restock on food and water, wash clothes and recoup some energy. 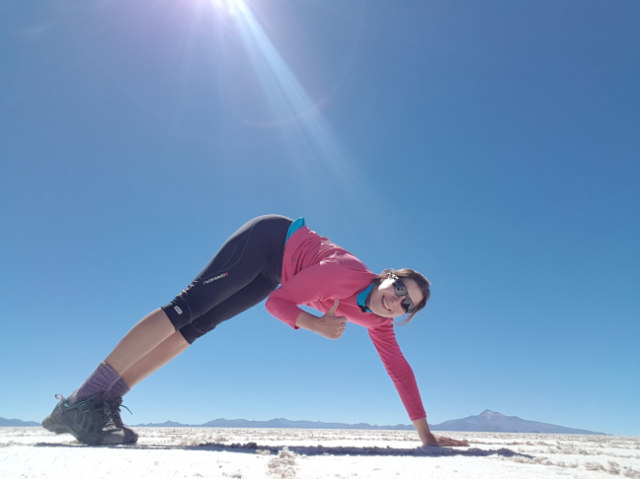 I was about to embark on crossing the Salar de Uyuni, the world’s largest salt flat. With a surface covering nearly 11,000 sq km, it would take me about 150km of riding to cross, over the course of 2 days. 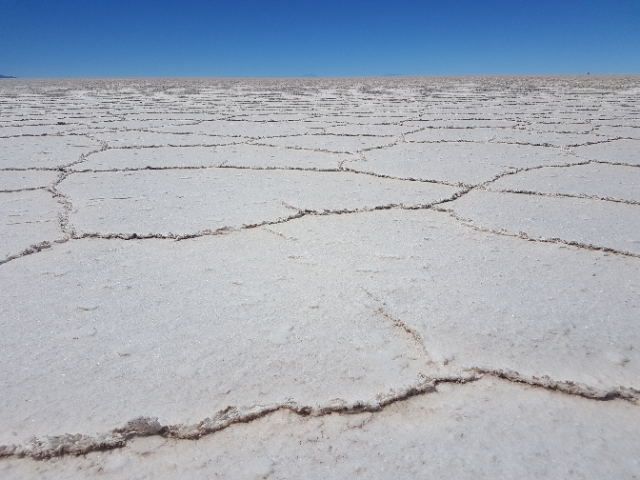 The salt crust varies between tens of centimetres to a few metres in thickness and underneath is a brine containing 50-70% of the world’s known lithium reserves. 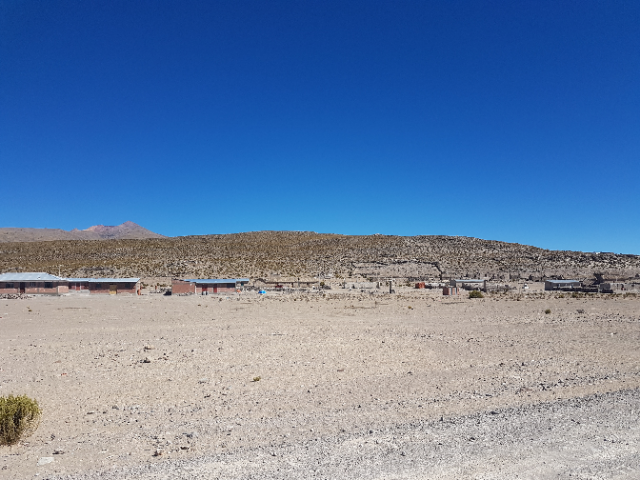 The surface itself sits at 3656m above sea level and varies in elevation by just one metre over the entire area – it is very very flat! 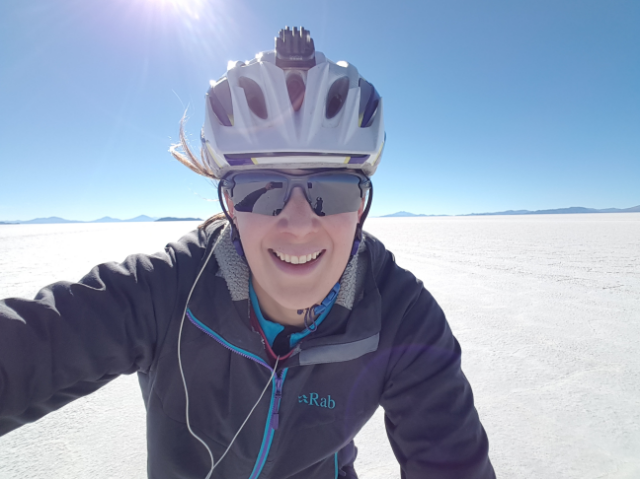 The Salar de Uyuni was an absolute pleasure to ride. With an older and thicker crust, the surface was a lot tougher and drier. It’s also covered in those pentagonal ridges which make for a very satisfying crunch each time the tyres break through. I was able to ride a lot faster and to be more carefree. 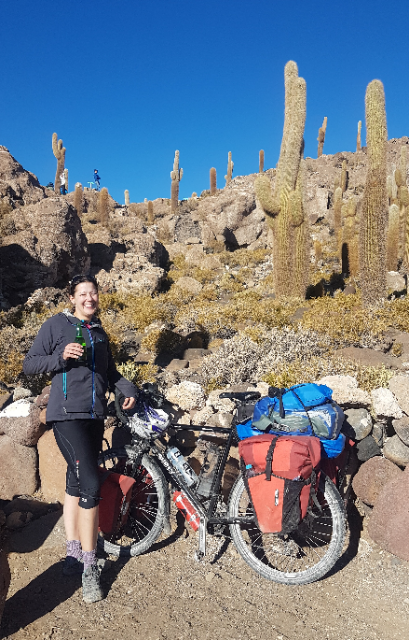 On the first day I aimed for the Isla de Pescado (Island of Fish) for a very solitary lunch 60km in, then the Isla Incahuasi just a further 20km on to stop for the day. After so many days of riding completely alone, it was a bit of a shock to cross paths with 4x4s and tourists on the Isla Incahuasi, but I certainly didn’t complain at being able to have a celebratory and belated birthday beer having made it this far. 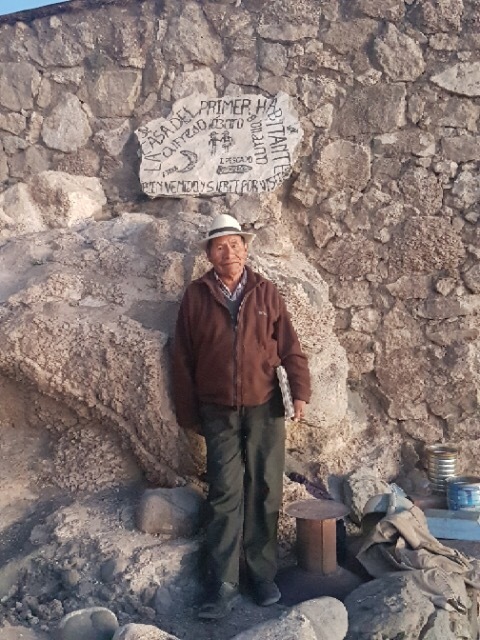 I met Alfredo, the first inhabitant of the ‘island’ who offered me a space on the floor of his ‘refugio’ for free for the night (a room with a table and chairs) in exchange for writing a note in his book – the pages of which had been graced by many a cycle-tourist. Watching the stars that night from an island in the middle of the world’s largest salt flat was another of those experiences to put life and the universe into perspective. 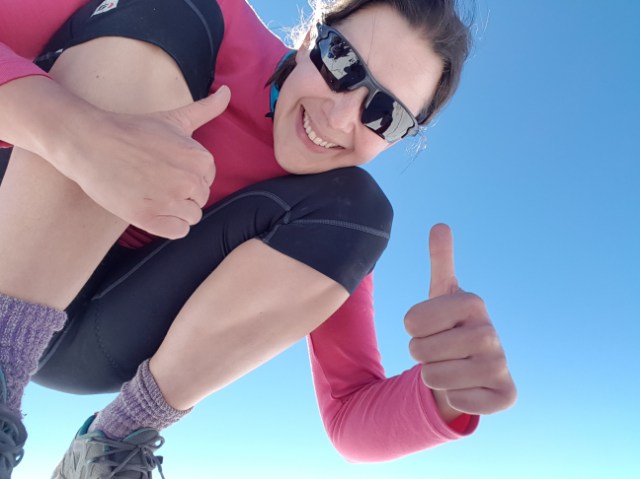 Time for some much-needed stretching out and messing about messaging the London Ladies after I realised there were patches of 3G coverage on the salar! Keeping an eye out for surprise potholes that started to appear on the final day! 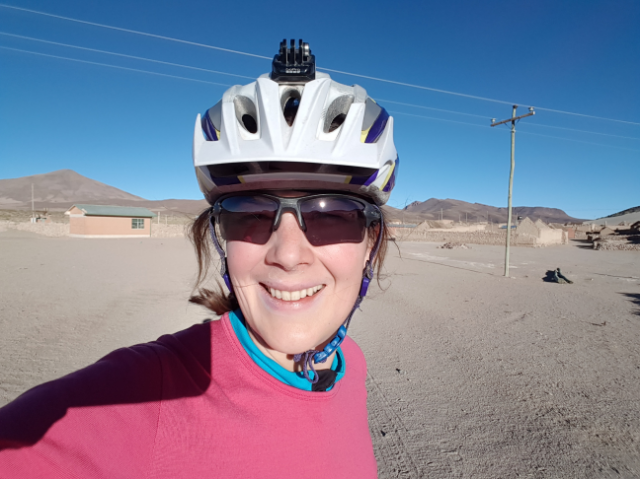 After 8 amazing days on my route from Oruro and across the salars, I felt like a more accomplished and confident cycle-tourer. The exposure of the wind and oscillating temperatures (from -4 to 30 deg C) of the salars and the graft of pushing through the sand had definitely taken its toll (raw nose, ulcerated bottom lip after they’d stuck together one night thanks to the cold!, cut and bruised calf and ankle from the pushing, and the skin covering my sit bones definitely in need of a break). 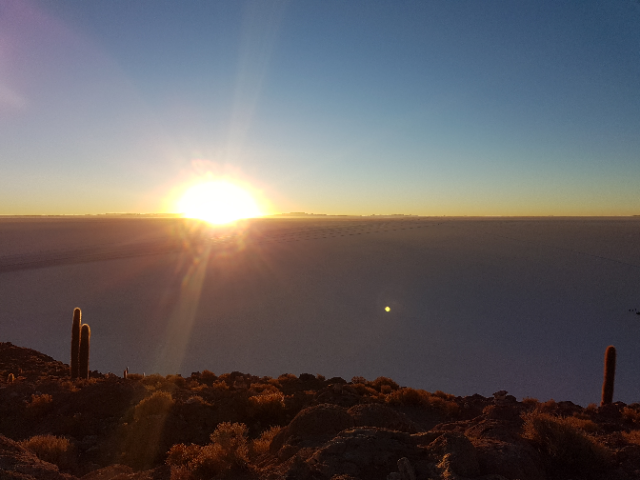 I pushed ahead to complete the final 25k into Uyuni, to a very welcome comfy bed and hot shower, having experienced something so surreal it’s still hard to compute.